The core of our business relies on innovation, we continiously improve the range of informatics solutions that we offer. 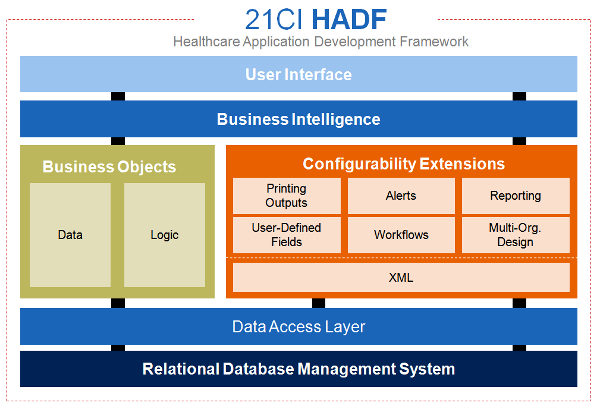 21CI HADF is an Application Programming & Management Framework. The framework includes an exhaustive library of business logic, processes, programming and data presentation functions that empowers system administrators and configurators to transform the application to meet the changing business dynamics. All 21CI healthcare solutions like HIS, LIS, EMR, PACS etc. are built using our HADF platform. This enables our solutions to meet future business requirements. The Data Access Layer makes the products developed using HADF database independent. The underlying business logic does not change even if the database system is changed. By incorporating standards like HL7 and XML, HADF provides the ability to interact with third-party systems which may be technologically, linguistically, legally and culturally disparate.